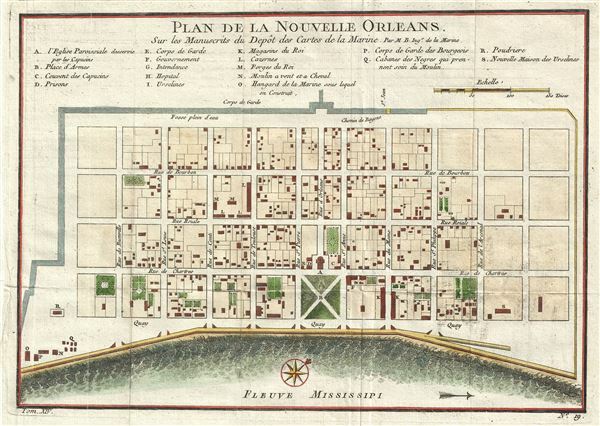 The earliest obtainable map or plan of New Orleans, Louisiana. Plan de la Nouvelle-Orleans sur les Manuscrits du Depot des Cartes de la Marine. This scarce 1744 map by J. N. Bellin is the earliest obtainable map of New Orleans, Louisiana. Oriented to the east, Bellin's map covers the original settlement of New Orleans along the Mississippi River and inland as far the Fosse plein d'eau (roughly translated: 'Pit full of Water') near modern day Dauphine Street, and from modern day Iberville Street (shown but not named) to modern day Barracks Street (shown but not named). The map shows some 100 buildings with some 18 specifically identified via an alphabetically coded table set just above the map. There are several editions of this map, although after the first state, distinguishable for the inclusion of the engraver's name in the lower right margin, it is difficult to distinguish specific editions. The preset example most likely dates to a 1745 or 1746 edition. Bellin originally prepared this map to illustrate Pierre François Xavier de Charlevoix's Histoire et description generale de la Nouvelle France. Later editions, most with slight modifications, were issued to accompany Provost's Histoire des Voyages and reissues of Charlevoix. Charlevoix's history and this map in particular thus proved exceptionally influential as one of the most comprehensive works on North America predating the French and Indian War. Copies of the Histoire et description generale were to be found in the libraries of many 18th century luminaries, including Voltaire, Franklin, and Jefferson. Jefferson especially admired Charlevoix work, calling it 'a particularly useful species of reading' and no doubt influenced his decision to pursue the historic 1802 Louisiana Purchase, possibly the most significant event in the post-colonial history of North America. Very good. Lower and right margin trimmed. Original fold lines exhibit minor wear. Blank on verso. Lemmon, A., Magill, J., and Wiese, J., Charting Louisiana: Five Hundred Years of Maps, #171. Brown University, John Carter Brown Library, E744 C479h5.